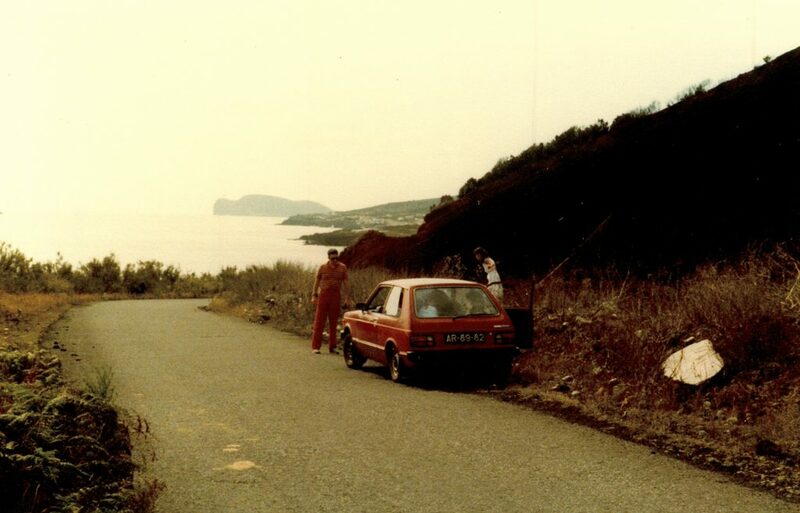 It was the summer of ’82, the guys had been working at CRC Lauda for a year. There were approximately 30 to 35 US Army Officers & Enlisted assigned to the unit. They worked side by side with a German Luftwaffe Tactical Fighter Control Unit which fell under a NATO SOC Command. Their responsible was for the air defense of Central Europe and the Fulda Gap. They went to work in the dark, come home in the dark and worked in “The Bunker” at Bad Mergentheim with no windows. It was time to find a new job and come out of the dark! 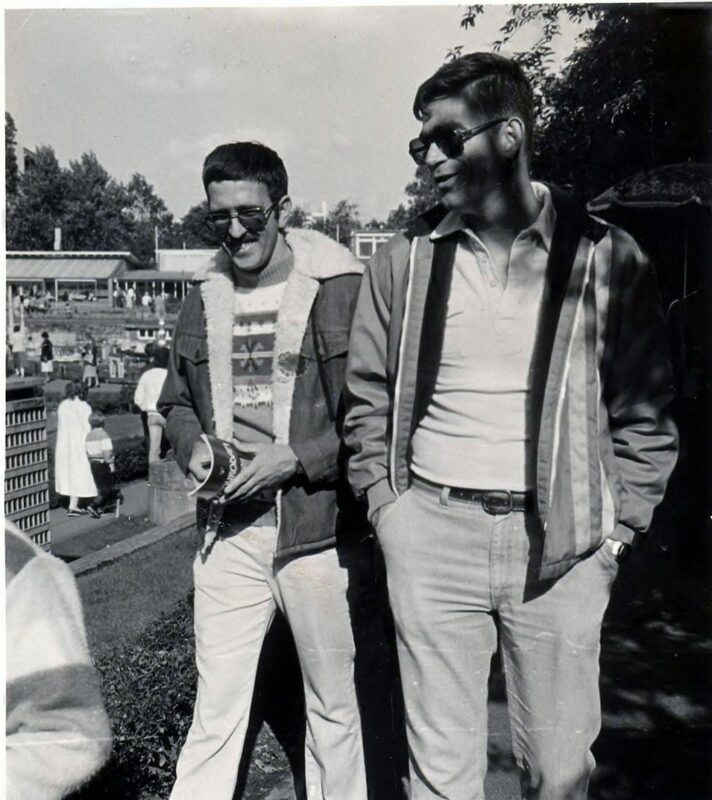 Steve became the Battery Commander of 10th ADA Group and Fred became an Operation Officer at Headquarters 32nd AADCOM. So the two families packed their stuff and off to Darmstadt we went. 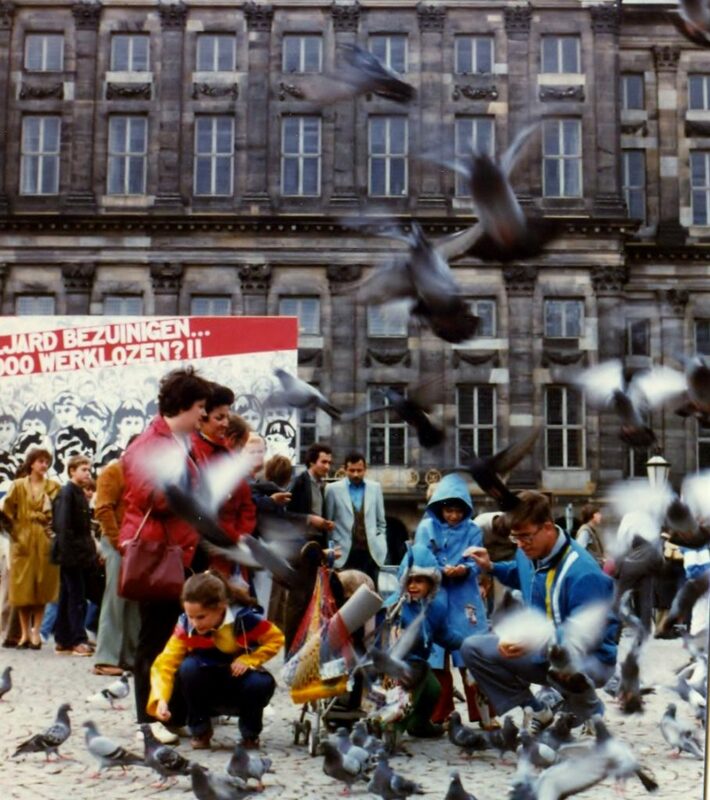 ,From the first time we went to Holland in 1974, it has been my favorite country. The windmills, canals, tulips, people, historical places, food and all the fun we had is just a few things that come to mind when I think of Holland. What also comes to mind is that every time we went to Amsterdam our van was broken into. 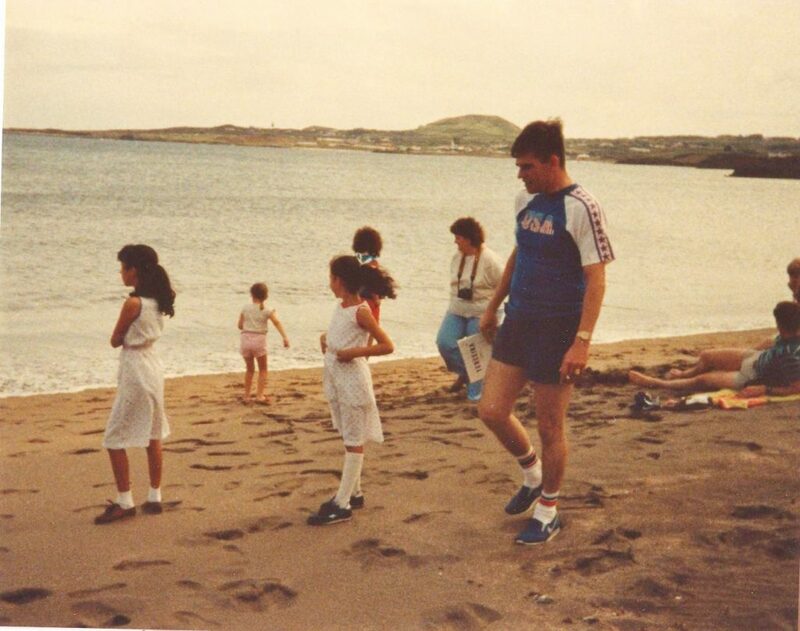 A tape recorder, the girls had left in the van, was the only thing of any value taken. It was just the frustration of having to clean it up afterwards. Imagine a Volkswagen van, a group of four adults and four girls and all the suit cases of clothes, snacks and games this group would have for a week’s stay. The thieves would open everything up and throw from one end of the van to the other. Now you may be wondering, why were there suit cases in the van if we were staying in a hotel. Well, the hotels were not very wide nor deep so there were only three or four rooms per floor. The stairs were about 18 inches wide and very steep, so carrying American size suits cases up 3 to 4 flights of stairs was not easy. Therefore, we only took in what we needed for the night. The guys had to go to Apeldoorn, Holland for a week of training. We got the girl’s homework assignments and off we took. While they were doing training, the girls went exploring in the surrounding area. We did well getting around except for two hiccips. The first was when I went down a one way street the wrong way. The other when I lost the van keys. Never did fine them! 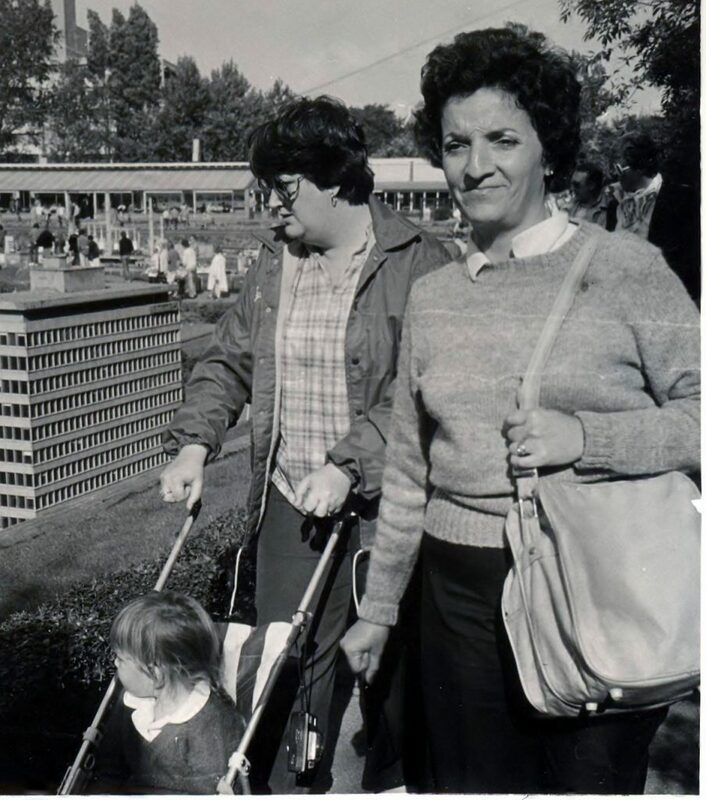 If I remember correctly, the wooden shoe factory was our favorite discovery that week. After Steve and Fred finished the week of training, we went into Amsterdam to spent the weekend. Another couple and their children went with us. Their kids wanted to eat at McDonald’s, which we thought, “we did not come all the way to Holland to eat at McDonald’s.” But we did and they were happy kids. 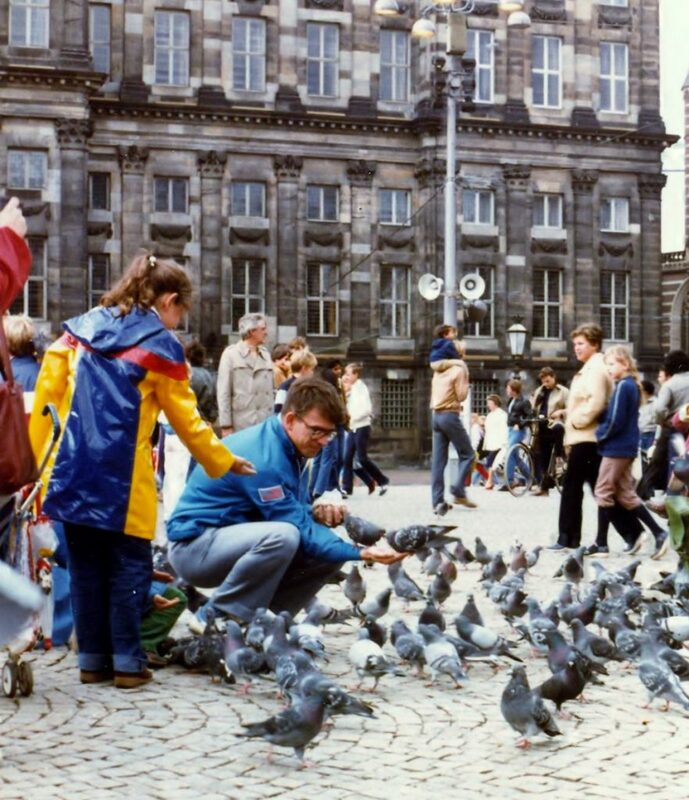 In the picture you can see that Holan was not enjoying feeding the birds in the square. She is still so afraid of birds! We planned for months for our three week trip to England. We took a day ferry from Holland to just south of London. 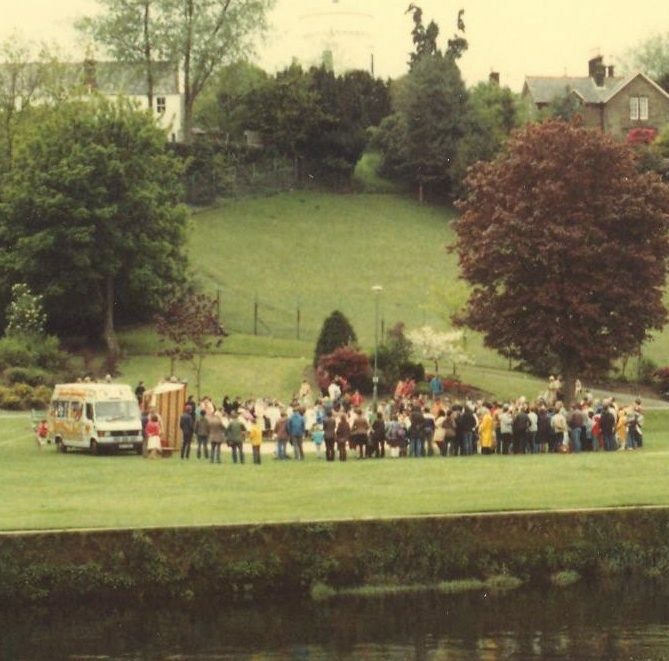 The picture shows us waiting for the ferry to leave after we had loaded the van into the hull. 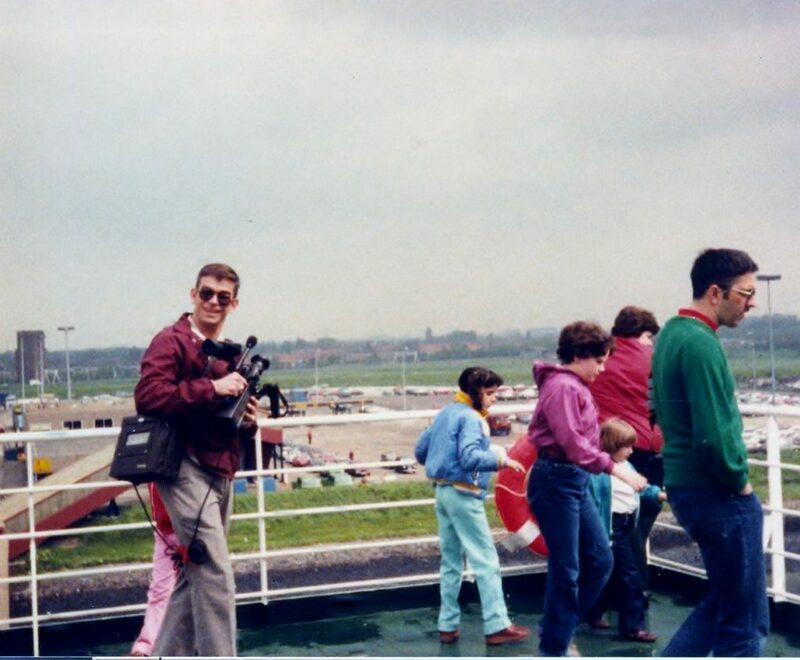 The big camera and large box hanging from Steve’s shoulder was our first video camera and purchased just for this trip. Our first night in England we stayed in a Bed and Breakfast in Canterbury. The next morning at breakfast, the owner told us Lady Diana would be at Canterbury Cathedral that morning. 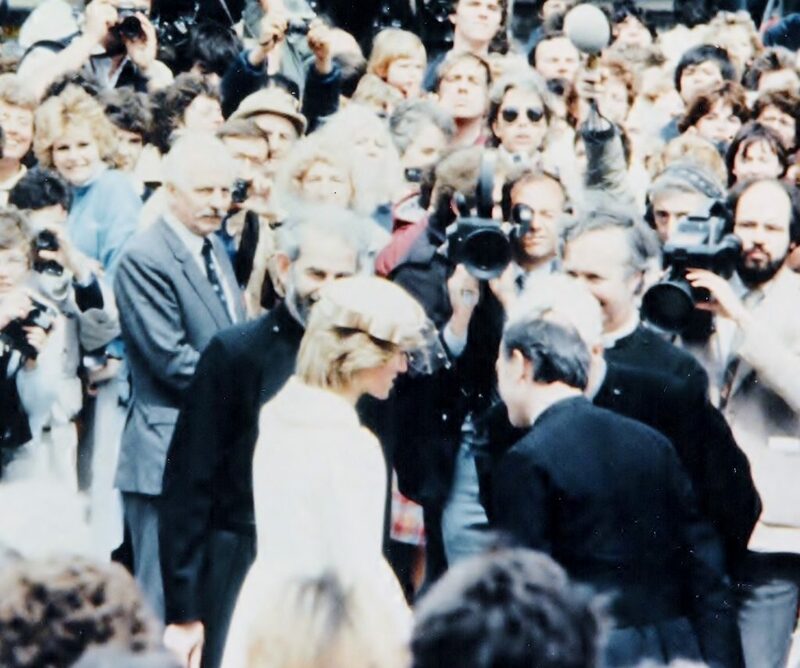 We stopped by the Cathedral and found hundreds of people waiting for Lady Diana. She entered the narrow passage, greeting admirers. As she passed Steve, she accidentally she stepped on his foot. He was so surprised when she stopped to apologize, he turned off the camera. It turned out to be a fun unexpected stop. Brighton Beach, Stonehenge and many castles were visited before we reached Liverpool. Every B&B we stayed in offered a good night’s rest and a wonderful English breakfast. One day we needed ice for our coolers. European nations are not known for using ice like Americans do, so it was a challenge. We finally found a market and filled our cooler up, without even thinking that it was not smart to buy ice at a fish market. We were soon dumping the ice on the side of the road. It took a couple of days to get the smell out of everything! The Girl Scout Songs and games helped a little to take our mind off of the fish smell. Once in Liverpool, we left the van and took a ferry over to Dublin. It didn’t take long before a group of young ladies wearing VERY HIGH high hills, were distracting us by asking questions. Fred immediately alerted us they were pickpockets. We moved on and away from them very quickly just as policemen came running down the street blowing whistles. It seems they have very talented pickpockets there and these could run very fast in hills. Dumfries, Scoutland was our next stop. We did not know until we got there that it was the weekend for the The Dumfries and Galloway Arts Festival. 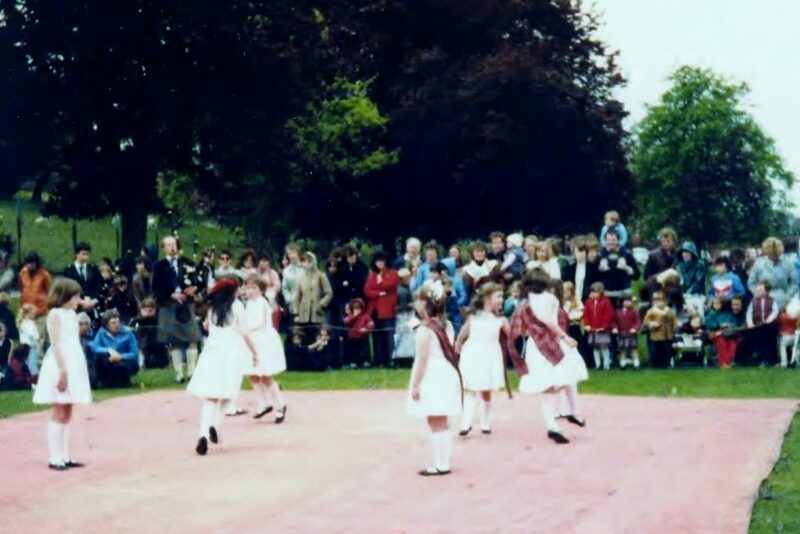 It is described as “Scotland’s largest rural performing arts festival”. The Punch & Judy Show was fun, along with the other performers showing off their Scottish talents. We got into the van, after having had a wonderful day ready to head out to our next city. Steve started the van but it wouldn’t turn over. After hours of waiting, we found out that the fuel pump had gone out, it would take a week to get the pump from the States and to do the repair. We were going no were anytime soon. It was time to regroup. We had enjoyed our day in Dumfries but we did not want to spend the rest of our vacation there. A train was leaving at midnight for London but what to do with four children until then? We found a movie theater, purchased tickets and filled the hours until it was time to be at the station. At midnight we boarded the train and it quickly came to our attention, we would be traveling with a group of World Cup fans. Very drunk World Cup fans going to London for the games and they sang songs about Meggie Thatcher, Prime Minister of the United Kingdom, all the way to London. The songs had words and actions we had never heard in our lives. We had quite the education that night as the train sped through the night. The next morning we put our night of adventure behind us, started enjoying our sightseeing and made some wonderful memories. One of the funny memories was when Steve was caught by a guard at the Tower of London for filming the Crown Jewels. He told Steve “I see your red light on your camera. I may be dressed like a Penguin but I’m not stupid.” Steve made a hasty retreat for the exit and started erasing the tape. During our travels in England, Fred and I were reading Star Wars Return of the Jedi. Every morning at breakfast, I looked forward to our book review of what we had read the night before. 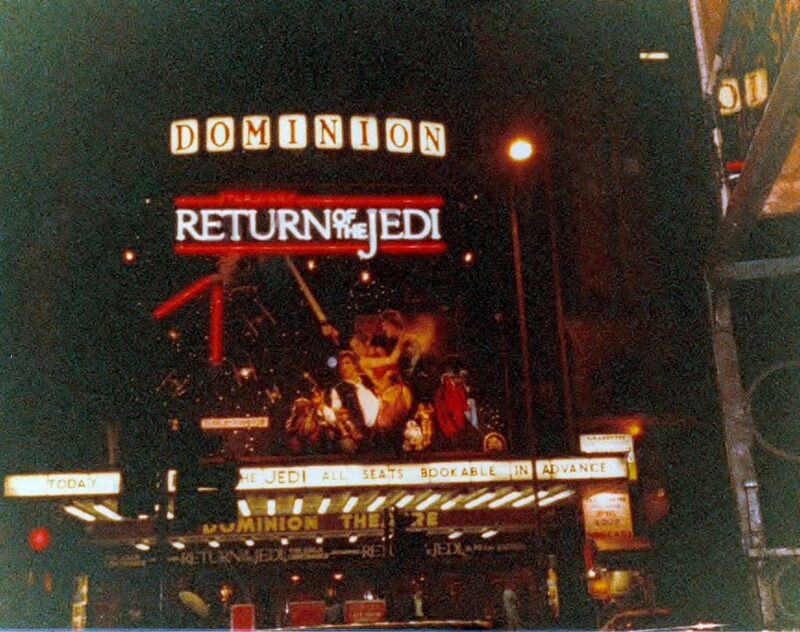 While in London, Return of the Jedi was showing at the historical Dominion Theatre. It was a great movie and I enjoyed it more because I had read the book. Books always have more details than what they can put into a two hour movie. For years after this, if a movie was based on a book I tried to read it before seeing the movie. As the week came to an end, the guys took a train back to get the van. Upon their return, we took an overnight ferry from England to France and drove on to Germany. 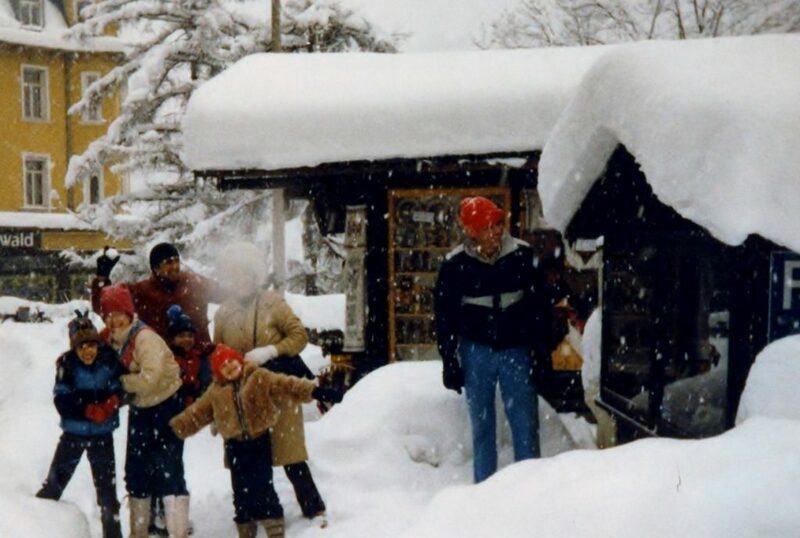 In February of 1984 we went to Berchtesgaden, a German town in the Bavarian Alps on the Austrian border. We stayed at the Armed Forces Recreation Center’s main hotel, the General Walker. This area had been a former lodging center for high ranking Nazis and German officers when they came to visit Hitler. The girls were all enrolled in ski classes for the week, while the Dads took to the slopes at their own pace. Lupe and I spent our week watching the ’84 Winter Olympics from Sarajevo, working on cross stitch projects and consuming hot chocolate, talking and gazing out the windows watching snow falling. One morning we ventured off the mountain to the village below. We did some shopping, had lunch and were enjoying the falling snow. When it was time to meet the family for dinner we started back up the mountain. It had snowed more than we realized and almost didn’t make it back to the lodge. However, the VW van with the engine in the back got us there. It was a wonderful week with over 36 inches of snow falling while we were there. Great for skiing!! 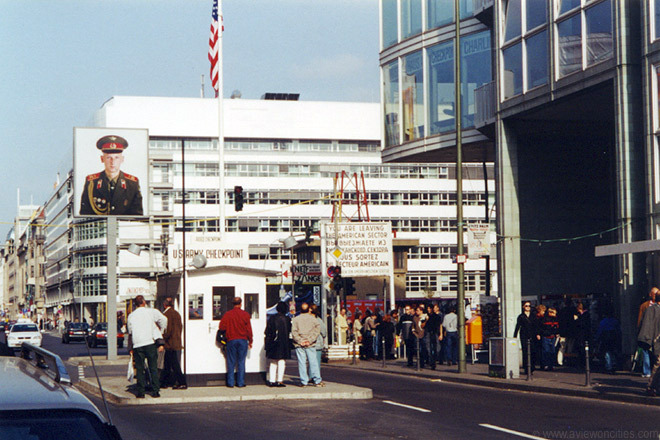 In May, 1983 my appointment to the North Atlantic Girl Scout Chairman for the Darmstadt Neighborhood took place in East Berlin. I was allowed one person to accompany me to Berlin. Steve could not go because of his security clearance and his current job. Lupe and I boarded the military troop train for our two day adventure of Girl Scout training, sightseeing, and crossing over into and out of a Communist country. 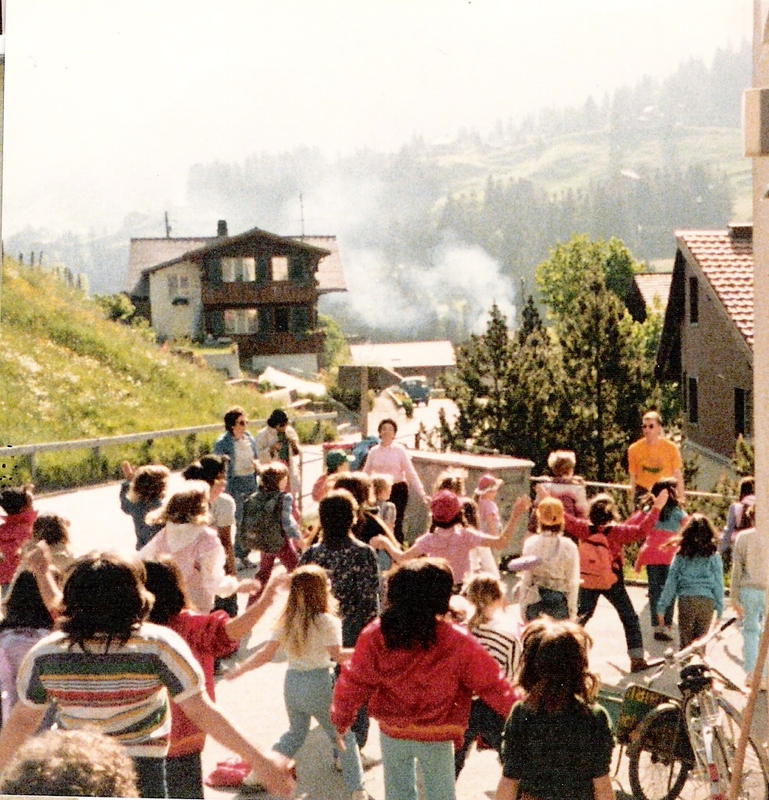 On May 31, 1984 my term as GS Neighborhood chairman came to an end. 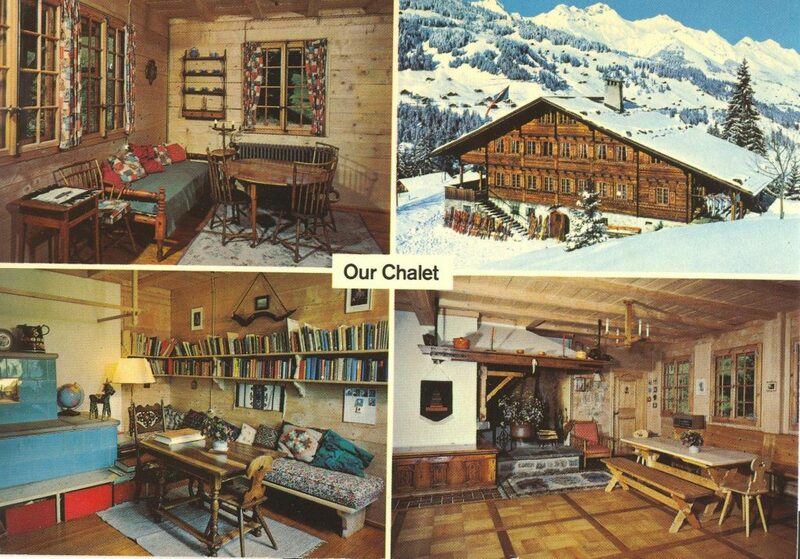 However, we had an end of the year trip planned to Our Chalet in Switzerland, one of the four Girl Scout World Centers. I completed this last event before handing over the troops. 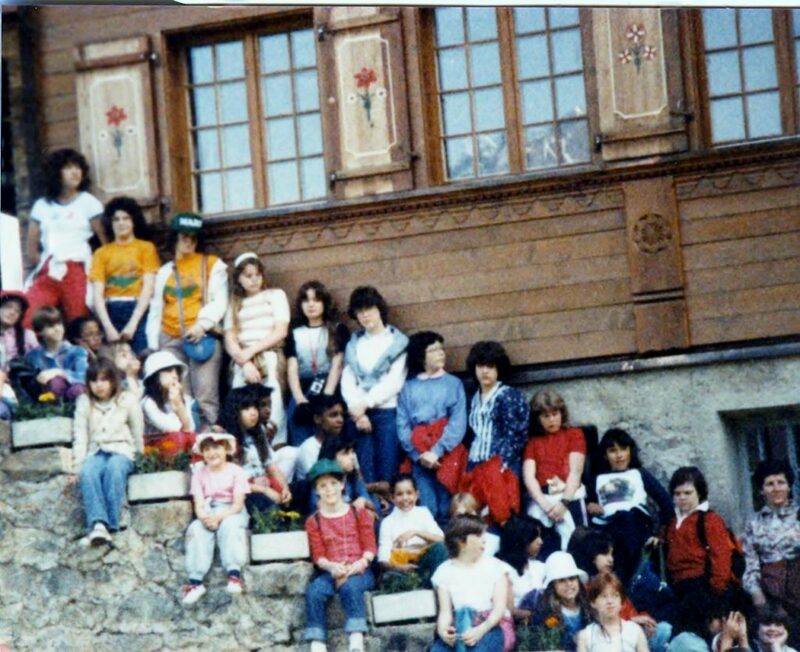 We rented a German tour bus, packed our van and a station wagon, rented a Swiss Chalet, and took along 46 girls and 17 adults. Our four girls road on the bus, while we traveled in the van, which seemed very empty with just the four adults. Every morning Steve and Lupe lead stretching exercises. Steve, with our support, did his share of KP duty along with organizing hikes and spending four hours cooking pancakes for the breakfast. It was a great trip of hiking, ice skating and sight seeing. The snow capped Alps were beautiful and the grass so green. For our trip to Terceira Island Azores, Portugal, we decided to do something a little different. We registered for Space A travel on a military aircraft. 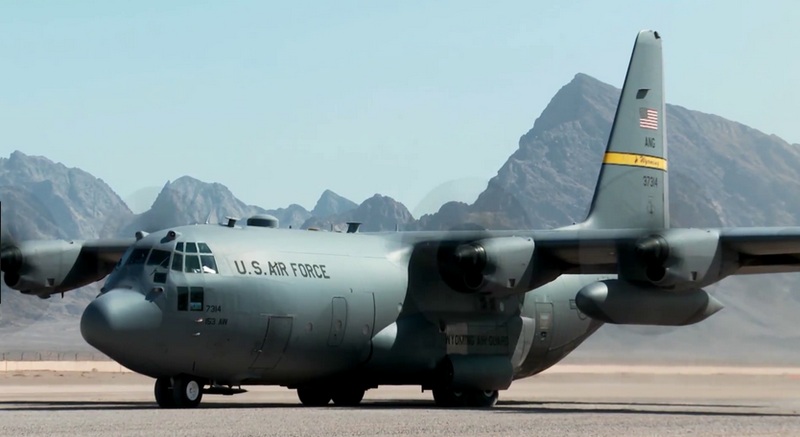 This meant we would be on stand by for the flight, the flight would cost $10 per person and we would be traveling on a C-130 military transport plane. It was an interesting flight because of the sidewall seats that consisted of strap seating and the rear ramp, which was used to drive vehicles, to included tanks, onto the plane or carry large airdrop cargo. Once we arrived, we checked into the BOQ and picked up our car rental. The car was a VW rabbit, a little small for eight people. Kristie sat on my lap, Maria on Lupe’s and Holan and Carmen in the back with their face pressed to the back window, like bugs splattered on a windshield. Lucky for us, the island measured roughly 8 miles by 15 miles so anywhere we went was not going to be a long trip. We traveled the island and shopped. 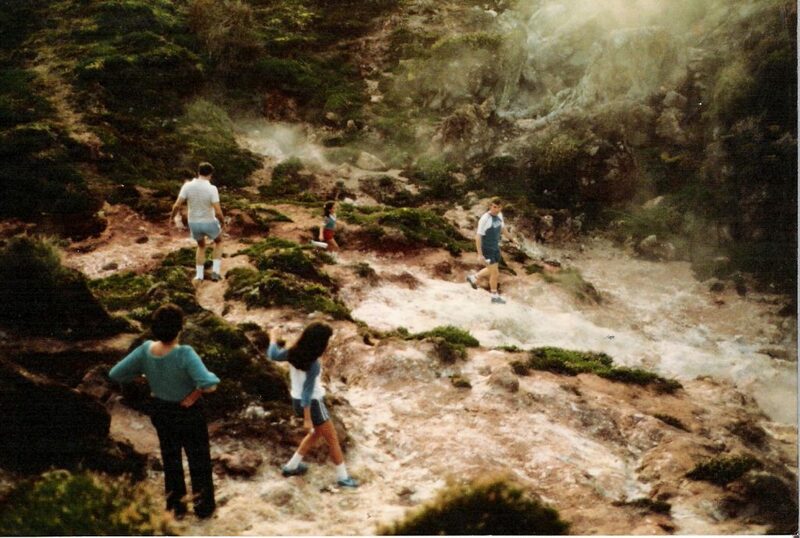 As the sun was sitting upon the ocean, bats flying from caves and steam rising all around us, we thought we had found the location or produce our first horror movie. We spent time on the beaches while waiting for our Space A flight back to Germany. The flight was a little different this time, we were on a Medical evacuation flight. 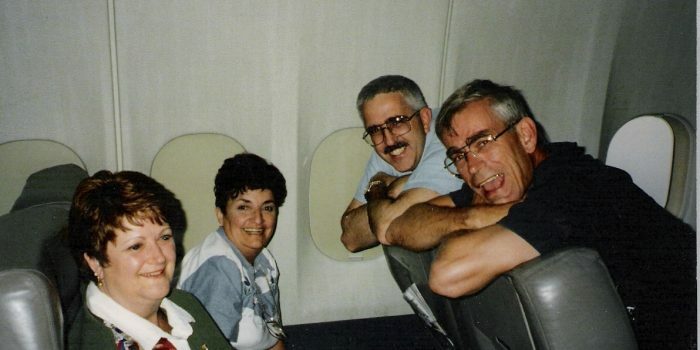 This time we had regular airplane seats, but they were turned around, so we were facing the back of the plane instead of the front. There was one patient on board. As the fall turned into winter, our travels came to an end but we were all busy getting ready for our move back to the States. The Rotchfords were going to Ft. Bliss and we were headed to Norfolk Naval Base. We still made our trips to our favorite Chinese Restaurant in downtown Darmstadt. The girls would visit the McDonald’s below before joining us upstairs for dinner. The Restaurant never cared that they would bring their sack dinner up to eat with us. We would order 6 or 7 dishes to share, which was more fun than ordering just one a piece. It was also a way the girls could eat McDonald’s and Chinese. We also continued to finish up GS badges, community volunteering and military activities.